The dns_probe_finished_nxdomain error is common in Google Chrome users on Windows 7, Windows 8.1 and Windows 10. The error does not occur on all the web browsers but is mostly limited to Google Chrome. If this error occurs on your Chrome browser, you won’t face this error on Mozilla Firefox or Internet Explorer at the same time. However, at times, you may not be able to access any browser on your PC, be it Mozilla Firefox, Internet Explorer or Google Chrome. The dns_probe_finished_nxdomain usually occurs because the DNS lookup has failed while accessing the web page. This error in Google can be a temporary one. In that case, a simple restart can fix this error. If not, you may need to follow some extra steps to address this error. Another reason for this error could be your VPN connection or your anti-virus. Disabling them can also resolve this error. Another common solution for this error is to flush the DNS server or to change the DNS server on your PC. Since there is no single solution for this error, we will be trying each available method to fix the dns_probe_finished_nxdomain error in Windows 10. Below I have listed 7 methods to fix DNS_probe_Finished_NXDOMAIN error in Google Chrome. Do follow all the methods until you have the issue resolved. As I said earlier, the dns_probe_finished_nxdomain error could be a temporary error and can be resolved with a simple restart. So, close Google Chrome browser if you have it open. Close all the open programs on your PC and restart it. After the restart, connect to the internet and try to access any web page on Google Chrome. If the restart has resolved the error, you don’t need to anything else on your PC. The error “DNS probe finished nxdomain” can also be fixed by resetting your Chrome settings to default settings. To do this, follow the steps given below. It will open the “Chrome experiment” section. At the right side, you can see a “Reset all to default” button. Click “reset all to default” and restart your Chrome browser. Clicking on “Reset all to default” will reset your Chrome settings to the default state. Now try opening the web page that was giving the “DNS probe finished nxdomain” error and see if the error has been resolved. After restarting your PC, if the error did not appear immediately, it may return after few hours of usage. Some users have reported that, after restarting the PC, the Google Chrome browser works fine. However, after a few hours of usage, the dns_probe_finished_nxdomain error occurs again. It continuously happens with every restart. Now to resolve this error, you can try flushing the DNS and see if it can resolve the error. 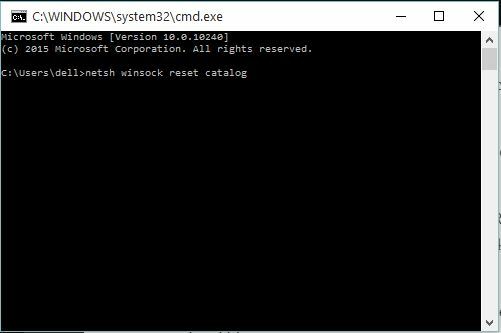 To flush the DNS, open elevated command prompt (command prompt as admin). To do this Press Windows key + X and select Command prompt (admin). Or Right-click on Star button and select ” Command Prompt (Admin)“. If not press Windows Key + R and type cmd in the Run dialogue box. Alternatively, search cmd in the search bar, right click on cmd.exe and select Run as Administrator. After the execution of the command, reboot your PC. Try opening Google Chrome and try to access the web page. In most cases, this should fix the dns_probe_finished_nxdomain error. If flushing the DNS didn’t resolve the error, you may need to change the DNS settings and change the DNS server to something else. Here is how to do it. There are two ways to access the Network and Sharing centre section. Go to Control Panel, click “Network and Internet” and then click on Network and Sharing Center.2. Right click on Network icon in your taskbar and select “Open Network and Sharing Center”. From the Network and Sharing Center section, click on “Change adapter settings” (left pane ). Now, double-click or right-click on your current active internet connection and select Properties button. 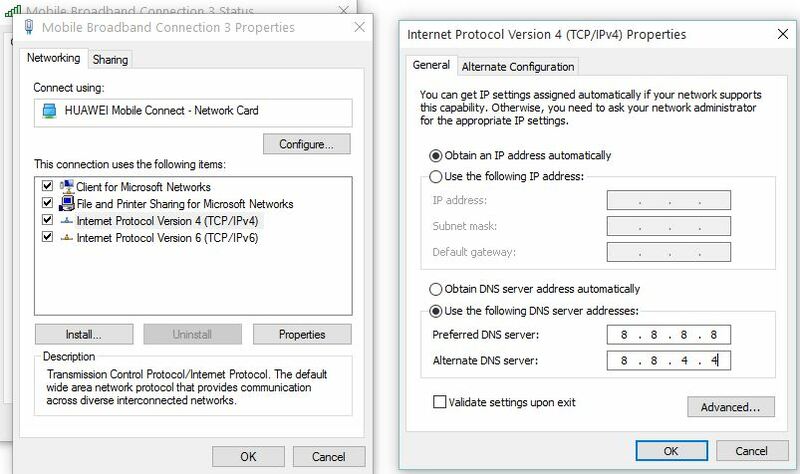 Double-Click on the Internet Protocol Version 4 (TCP /IPv4) to bring up the properties window. Now at the bottom of the Internet Protocol Version 4 window, select “Use the following DNS server address“. Here we will be using Google’s public DNS server address. Set records as mentioned below. Click on Ok to save the settings. Click OK again and close the Control Panel. Reboot (restart) your PC once. After the reboot, open Google Chrome browser and try to access any webpage. This time, the dns_probe_finished_nxdomain error should not occur again. Restarting the DNS client from Services can also fix this error in Windows. To do this, press Windows Key + R, and type services.msc and hit enter to open Services window. 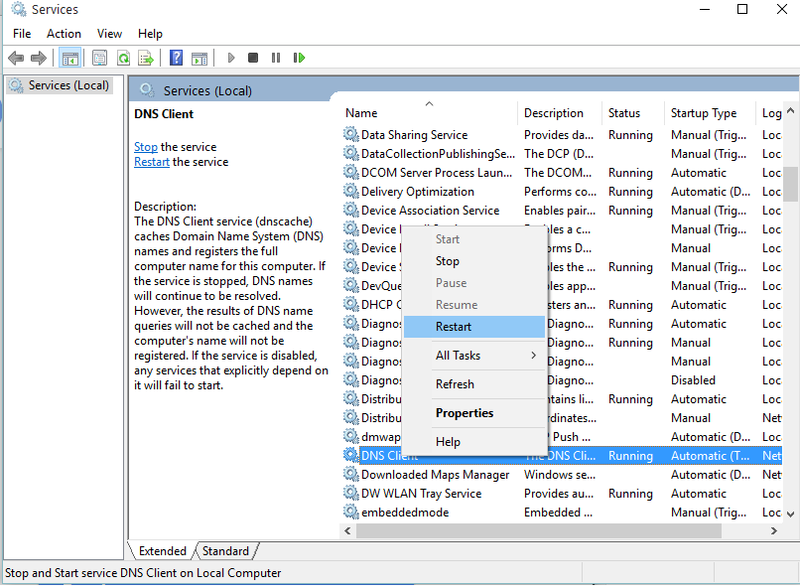 From Services, find DNS client and right click on it. From the options, click on “Restart” to restart the “DNS client”. Once done, try to open Google Chrome and access the web page that was giving the error. If you have installed any VPN client on your PC recently, you may face the dns_probe_finished_nxdomain error on your PC. The VPN client might block the DNS while accessing any web page using Google Chrome. What you can do here is temporarily disable your VPN client. If disabling VPN client didn’t work, you could try uninstalling the VPN client from your PC. Once uninstalled, reboot your PC and see if the error has been resolved. The methods mentioned above should fix the dns_probe_finished_nxdomain error on your PC. However, in case you were unable to resolve the error, you may need to restore your PC to the earlier point. Restoring your PC to last restore point can fix some major and minor issues with your PC occurred due to corrupted drivers or software issue or because of improper settings. Note: Restoring your PC to last restore point will remove any software installed after the restore point creation. So, this was about how to fix the dns_probe_finished_nxdomain error in Windows 10 and other PCs. Do let us know your thoughts in the comments below. Wow, it worked! i have flushed out the old DNS caches just the way you have instructed, and now my error issue is gone. Thanks for the guide Shareef.